Dr. Susan P. Keane (Psychology) received a continuation of funding from DHHS-Health Resources and Services Administration for the project “Behavioral Health/Primary Care Integration: Reducing Barriers to Care in Underserved Populations.” This training grant interfaces the UNCG Clinical Psychology Program with a number of primary care sites in Greensboro and Durham including: Cone Family Medicine, Cone Center for Children’s Health, Cone Pediatric Residency Training Program, the Program for All-Inclusive Care for the Elderly,Triad Adult and Pediatric Medicine, and the Durham VA. Year 3 continuation funding provides $200,000 in trainee stipends to help prepare graduate students to enter the workforce and reduce barriers to care by providing behavioral healthcare in integrated health settings. Dr. Travis Hicks (Interior Architecture) received new funding from XDS, Inc., for the project “Penny Lane Farm.” Kristen Raizada is co-principal investigator for the project. The project will design three “tiny house” prototypes for The Farm at Penny Lane in Pittsboro, North Carolina, a working farm that provides horticulture therapy to adults with mental illnesses. According to Hicks, the house prototypes are helping shape the design of a tiny house village that will house mental health clients in dire need of affordable housing in North Carolina. “The prototype designs done by Travis and his students will serve as the basis for the 15-home village planned at The Farm at Penny Lane, a therapeutic farm that serves people living with chronic mental health conditions served by UNC’s Center for Excellence in Community Mental Health,” said Thava Mahadevan, Director of Operations for UNC’s Center for Excellence in Community Mental Health and Director of The Farm at Penny Lane. The abstract states that the overall objective of the research is to identify systemic public and private issues across neighborhoods within Rocky Mount, as well as creating multi-factor market prioritization maps, tables and reports for presentation at the project’s conclusion. The project will demonstrate target investment areas and opportunities, indicated areas of most cost savings, zones of high cost-burdened households and the “lost” value of vacant, substandard or abandoned property. The abstract notes that the project will work with 40 at-risk Hispanic children, aged three years or younger, by giving them a chance to develop their full potential at the earliest possible age. The project will work with the children and their parents in their homes, ensuring early detection for mental health risks, assisting families in parenting strategies and providing appropriate referrals in supporting their children. Dr. Vas Taras (Management) will accompany eleven students in the Bryan School of Business and Economics in representing UNC Greensboro at the 2018 X-Culture Global Symposium in Macerata, Italy, from July 29 to August 4. The annual symposium brings together 150 of X-Culture’s top-performing business students from around the world for a week of lectures, competitions, networking events and more. Nuova Simonelli S.p.A.: Manufactures espresso coffee machines for the professional market. They operate in 109 countries around the world, exporting 82% of all production. They have a subsidiary in the U.S.
Cocci Griffoni Srl: An Italian family-owned vineyard and winery which for the past 100 years has produced authentic Wines of Terroir. The company slogan is “Stewards of the Land,” reflecting its passion for sustainability. Macerata Opera Festival: Promoted and organized by the Arena Sferisterio Association, the Macerata Opera Festival is held annually in the Arena Sferisterio open-air theatre. Student teams will create marketing plans to increase attendance at future Macerata Opera Festivals. The 150 students and 50 faculty attending were chosen through a highly-competitive selection process, drawing from the top ten percent of the 45,000 business students who have participated in the X-Culture program worldwide. X-Culture is an international business competition designed by Taras that connects MBA and undergraduate business students and working professionals worldwide to work on real business challenges presented by international companies. Taras first conceived X-Culture in 2010 while teaching an international business course at UNC Greensboro’s Bryan School of Business and Economics. Wanting his students to better understand the magnitude of international business concepts, Taras had the idea of connecting with an instructor in another country teaching a similar course. He reached out to fellow business scholars in the Academy of International Business, and, to his surprise, received dozens of responses in just a few hours. The program began with 500 students from seven universities in seven countries, and has since grown to include more than 3,000 students semi-annually from 150 universities in 40 countries. It’s been an exciting year for Spartan Athletics, with multiple teams going to NCAA tournaments and earning SoCon titles. An important part of UNCG athletic success – in the present and future – are the gifts that support student athletes and athletic facilities. UNCG Athletics recently received three unique major gifts across three sports – Women’s Basketball, Men’s Golf and Baseball. Two of those gifts come from UNCG or Woman’s College alumni. Women’s Basketball has received a historic gift from 1957 Woman’s College graduate and long-time Spartan Club member Jo Safrit. Safrit committed a $100,000 lead gift toward the renovation of the Women’s Basketball locker room. This is the first-ever gift to name a significant renovation or construction project for Athletics. The updated facility will be named the Jo Safrit Women’s Basketball Locker Room and is located in the Coleman Building. “Basketball is a game changer for women as well as men, and it changed my life,” Safrit said. Read more about Safrit, the new locker room and locker naming opportunities here. “This transformational gift provides for our golf program’s future and is a significant moment during an already historic year for the Spartans,” said Director of Athletics Kim Record. Read more about the history of Men’s Golf and the Saunders’ history with UNCG here. UNCG Athletics has also received a $150,000 gift from the estate of Edwin C. Jennings, 3rd to create the Edwin C. Jennings, 3rd Baseball Scholarship Endowment. The endowment will support student-athletes who play the position of shortstop for the baseball team. It is the first named endowment in UNCG Athletics history that supports a specific position on a team. The gift comes at an exciting time for UNCG Baseball. The team won the Southern Conference regular season championship, had six players selected in the Major League Baseball draft, and saw players Andrew Moritz and Matt Frisbee named SoCon Player and Pitcher of the Year, respectively, and Link Jarrett named SoCon Coach of the Year. Read more about Edwin C. Jennings, 3rd and UNCG Baseball here. Emilia Phillips (Creative Writing) has received a Pushcart Prize for her poem “Pathetic Fallacy,” and it will appear in 2019 The Pushcart Prize: Best of the Small Presses anthology. Phillips is the author of two poetry collections from the University of Akron Press, “Signaletics” (2013) and “Groundspeed” (2016), and three chapbooks. Her poems and lyric essays appear widely in literary publications including Agni, Boston Review, Ploughshares and Poetry. Her third book, “Empty Clip,” will be published by the University of Akron Press Spring 2018. Phillips is also at work on a new poetry manuscript, “Thunder Thighs,” a collection of lyric essays,“Wound Revisions,” and a series of craft essays for the Ploughshares blog. She is also in the initial stages of a digitization project that will feature contemporary poetry broadsides in a UNCG open access online gallery. June 21 marked the official start of summer, and a wonderful day for Facilities, who celebrated their employees with recognition of exceptional staff members, an address from Dr. Mike Perko of UNCG’s department of Public Health Education, and a lively barbecue on the lawn followed by a delightful multi-prize raffle. The presentation by Dr. Perko humorously and enjoyably underscored the importance of physical and mental wellness; prompting Facilities staff members to engage with a number of mini exercises that inspired lots of commentary and laughs throughout the audience. The presentation wrapped up with three key takeaway points for audience members: move every day, pay attention to what you eat, and take sleep seriously. Coordinated with assistance from the office of Sustainability, cookout fare was accompanied by environmentally friendly compostable plates, forks, napkins, and cups. Also coordinated by the Office of Sustainability was the charming multi-prize raffle that featured pickings from among four lovely succulent plants donated by the Tiny Greenhouse, a stack of the iconic UNCG “Bucket List” t-shirts, a host of self-wellness literature, and sporty LimeBike “swag.” In total, more than twenty lucky winners got to bring home the prize of their choice. Many employees were nominated for their exceptional performance in three categories: customer service, safety, and collaboration and teamwork, with three staff members ultimately being awarded. The informal yet meaningful ceremony was a wonderful display of recognition and gratitude for our Facilities workforce. UNCG’s Department of Communication Studies is one of 24 in a competitive field of 134 applicants around the country to receive a 2018 grant from the Association of American Colleges and Universities (AAC&U) to integrate civic learning and social responsibility as expected learning outcomes for students in the major. The Department of Communication Studies will build upon its long-standing commitment to ethics, free speech and democratic engagement to further enhance its civic profile nationally and to deepen its civic-based curricular offerings within the university. This fall, the Department of Communication Studies will launch a series of conversations on teaching for democratic thinking and civic action, involving faculty as well as undergraduate and graduate students to consider ways to build upon the reputation and recognition of the department’s community engaged scholarship. For more information, contact Dr. Spoma Jovanovic, s_jovano@uncg.edu. The first scanning event for UNCG’s PRIDE! of the Community project was held May 19. In partnership with the National Endowment for the Humanities and the Guilford Green Foundation, the PRIDE! project hopes to record the often invisible history of the LGBTQ+ community as it relates to North Carolina, especially in the Triad area and Greensboro. Digital Projects Coordinator David Gwynn, Special Collections Technician Stacey Krim and Manuscripts Archivist Jennifer Motszko were present at the first scanning event to ensure the transition from physical to digital went smoothly. Most of the items they scanned were from the Guilford Green Foundation. They hope that as time goes on, more LGBTQ+ people and organizations will take advantage of the PRIDE! scanning days. These events serve as a way to create digital copies of physical items such as photographs, t-shirts, organizational newsletters and records, bar or club fliers, protest signs, activism materials, letters and postcards, that will stand the test of time. “Our intention is to get the LGBTQ+ community excited about their own history,” said Motszko. The team hopes to digitize material from the LGBTQ+ community as a whole and historically underrepresented groups within the community, such as people of color, women, older people and transgender individuals. “Anybody who’s got a story to tell, we want to hear from, or anyone who has items that might be of interest,” said Gwynn. PRIDE! of the Community also held a scanning event this month at the Guilford Green Foundation’s offices located in Greensboro. UNCG’s gardens are often the favorite campus spots of students, staff and faculty. Hidden between buildings or along main thoroughfares, many have been created and maintained through gifts from UNCG friends and alumni. This summer, CW will highlight a few of them. This week, we’ll focus on the Alumnae Secretaries’ Garden (left), . UNCG’s Weatherspoon Art Museum announces its recent acquisition of several important objects by artists working both today and earlier in the twentieth century. These new acquisitions expand the museum’s holdings of examples by female artists and artists of color, as well as satisfy its strategy of acquiring artworks featured in its exhibitions. Acquisitions include: Sanford Biggers, “Paket,” 2016; Xaviera Simmons, “If We Believe in Theory #2,” 2009; Donald Lipski, “Untitled,” from the series Ah! Roma!, 2000; Louise Fishman, “Untitled,” 2001; El Anatsui, “Paper and Gold,” 2017; George Segal, “Fireside Chat,” 1991; Beverly McIver, “Oh, Happy Day,” 2001; and David Humphrey, “Hercules,” 2009-2010. Leaders in educating the next generation of entrepreneurs gathered at UMass Lowell this month for the seventh annual Deshpande Symposium for Innovation and Entrepreneurship. The symposium featured the annual Deshpande Symposium Awards, recognizing the best in entrepreneurial education. The Excellence in Curriculum Innovation in Entrepreneurship Award was presented to UNC Greensboro’s Entrepreneurship Cross-Disciplinary Program. Dr. Dianne Welsh, the University’s Hayes Distinguished Professor of Entrepreneurship, is the program’s founding director. The entrepreneurship major and minor at UNCG focus on the skills necessary to start a business, grow a business or enhance creativity and innovation in a corporate environment. Welsh is a globally known scholar in international franchising, family business and entrepreneurship. More than 57 million Americans are employed by small businesses and each year, 200,000 new startups launch in the U.S. alone. Dr. Welsh is equipping a new generation of entrepreneurs to find their path to success in the marketplace. Dr. Cathy Hamilton, director of UNCG’s Office of Leadership and Service Learning for the past 14 years, will retire at the end of this month. 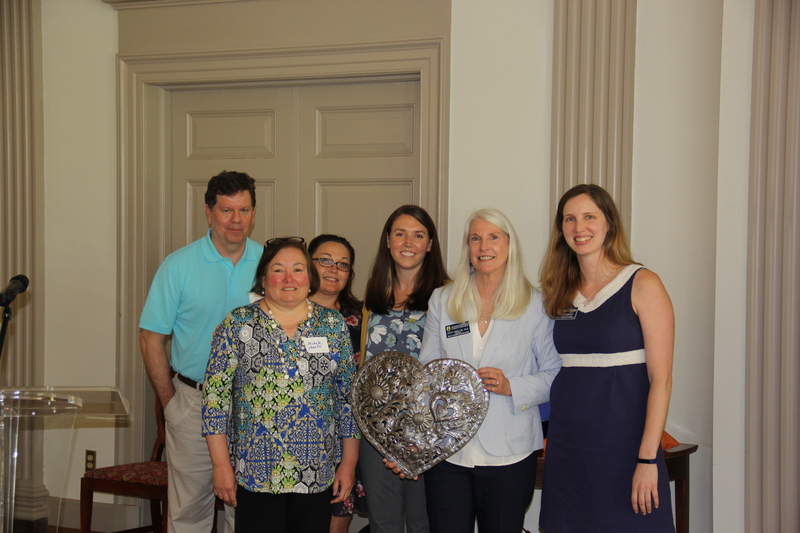 A retirement celebration was held on June 25 in the Alumni House’s Virginia Dare Room. Dr. Hamilton has worked in educational human resource development at the national and international level for the past 20 years, including leadership development, education, and publishing in Latin America. Through UNCG’s Office of Leadership and Service-Learning, she has provided support for both academic and co-curricular service-learning, student leadership and civic engagement. She taught courses in leadership studies through a courtesy faculty appointment with the School of Education and School of Business and Economics. She served as a Coleman Foundation Fellow with the UNCG Entrepreneurship Cross-Disciplinary Program. Hamilton has worked with faculty in university-community partnerships locally and also with education initiatives in Latin America. She is known for fostering collaborative alliances between universities and partners that together transform communities. She received her Ph.D. from the School of Human Resource Education and Workforce Development at Louisiana State University. She also holds the M.S. degree in Adult Education from Texas A&M University and a B.A. from the honors college (Plan II) of the University of Texas at Austin. Prior to coming to UNCG, Dr. Hamilton was the director of the Hartman Center for Civic Education and Leadership and part-time assistant professor at DePauw University in Indiana and as visiting assistant professor for Louisiana State University. In her retirement, Dr. Hamilton will continue to be a leader in service. She hopes to focus on alleviating food insecurity through community garden initiatives, in collaboration with refugee resettlement agencies. Vita not to exceed two single spaced pages. You may also submit a one page appendix for Editions, Translations, or Database Projects, or for Proposals that Include Visual Materials. This internal deadline provides time for a panel of five UNCG faculty to review the proposals and select up to two proposals that will represent UNCG in this prestigious competition. 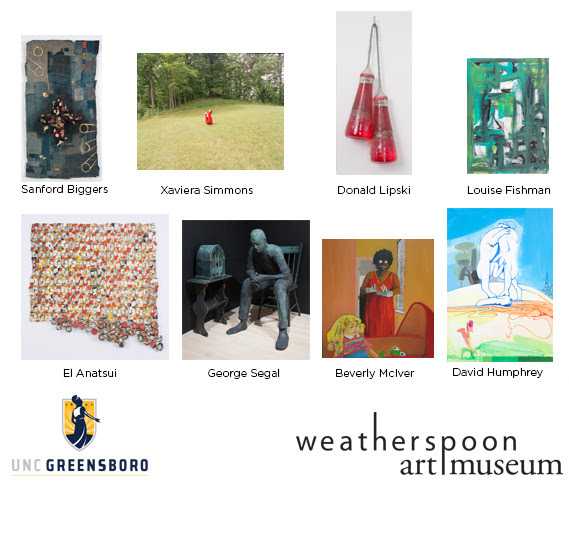 It’s the longest day of the year, and the best evening for artistic fun at UNCG’s Weatherspoon Art Museum. Friday, June 22, 6 to 9 p.m., the museum hosts its 14th annual Summer Solstice celebration in the Sculpture Garden and during the celebration, galleries are open for viewing. Between food, musical entertainment, kids’ activities and conversation, Solstice revelers can also experience nearly every medium across three lively exhibitions curated by Elaine D. Gustafson. “Extreme Measures” puts bold pieces, from WAM’s permanent collection into conversation with each other. A wild array of melted plastic chairs, buckets and coat hangers stands in contrast to a somber statue of a 1930’s era man listening to a radio “fireside chat” broadcasts by Franklin D. Roosevelt. Can’t travel this summer or wish to revisit cities you know? Across the hall, “City, Village, Exurbia: Prints and Drawings from the Collection” shows off a variety of European and American landscapes. The fine details of bridges and smokestacks, castles and skyscrapers emerge through diverse illustration styles. From Verona to New York City, go on a summer tour through the artists’ eyes. There’s even a 1942 sketch of Tate Street, for those who like to stay close to home. “City, Village, Exurbia” is open through August 26. Lastly, in the first-floor gallery, a video installation, “migration (empire)” by Doug Aitken, gets a little wild. For the video, the artist hosted a variety of indigenous wild animals in a roadside hotel and documented their experience. You may see some ruffled feathers here and there. In the adjacent gallery, Weatherspoon collection items provide repeat Aitken’s motifs and provide reflection on his concept of displacement. Together, the two displays are “Single Channel-Catalyst III,” open through September 30. In addition to the Summer Solstice Party, the Weatherspoon will host an evening event series, Tours & Treats, three times throughout the summer – June 14, July 12 and August 9. The free events include 30-minute guided tours, hands-on activities and cool treats in the Sculpture Garden. Find more information about Tours & Treats here. More than 60 faculty, staff and community stakeholders gathered on campus at the Lifetime Eating and Physical Activity Practices (LEAP) summit May 11. 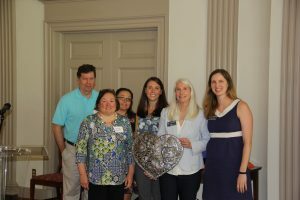 The summit, made possible by a collaboration between UNCG, Cone Health and the Guilford County Department of Health and Human Services, was held to discuss common indicators that existing program providers and residents can use to inform their health and wellness efforts. Multiple nonprofits, city and county departments, and health organizations contribute to LEAP initiatives, including Guilford County Schools, Greensboro Parks and Rec and Ready for School Ready for Life. Read the full story at UNCG Now. Visual: UNCG faculty, including Dr. Emily Janke (pictured), were part of the summit. Photography by Martin Kane. On Friday, June 1, UNCG received national attention as the official kick-off site for The Department of Housing and Urban Development’s (HUD) Healthy Homes Month. Dr. Stephen Sills (in visual), director of the UNCG Center for Housing and Community Studies, organized the Innovations in Planning for Better Community Housing and Health Symposium in conjunction with the Richmond Memorial Health Foundation to share lessons learned, best practices and insights from a variety of thought leaders across the region. The event drew the attention of HUD Secretary Dr. Ben Carson, who delivered keynote remarks, as well as local dignitaries, business leaders, including Cone Health CEO Terry Akin, along with city planners, community officials, nonprofit leaders, researchers, students, advocates and other professionals whose work relates to health and housing. See the full story in UNCG Now. Interested in housing topics? The next Housing Hangout will be held Friday, July 13, noon to 2:00 PM in MHRA Building, Room 1607. The topic will be THE STATE’S ROLE IN HOUSING POLICY. At this Housing Hangout, learn about financial tools that are available for municipalities from state agencies and discuss past and upcoming legislation related to housing. Snacks and refreshments are provided to all attendees. Presentations will begin at 12:15pm, following 15 minutes of networking for attendees. The UNC System will launch a Student Success Innovation Lab, a newly created initiative that will help fund and evaluate cost-effective innovations that drive improvements in student success. The Lab will be launched with funds provided by just over $3 million from the ECMC Foundation and the John M. Belk Endowment. At UNCG, the new Spartan StartUp program is funded in part by the System Student Success Innovation Lab Grant as well as the Bill and Melinda Gates Foundation. Spartan StartUp is a five-week, residential program limited to a select group of incoming first-time freshmen during the summer term. The students in this Frontier Set program will receive individualized academic support and advising as well as the personal attention of faculty in an intensive, yet nurturing environment. Participation in Spartan StartUp, which begins later this week, is by invitation only, and UNCG anticipates 40 students will participate this summer. They will have the opportunity to earn seven credits in a five-week period and will experience a variety of out-of-classroom activities designed to familiarize them with campus and campus services. And it doesn’t end with the summer program. Spartan StartUp is actually a year-long transition program that begins with the five-week component in June/July, and continues throughout the academic year. The students will live with other students in the Spartan StartUp cohort, take selected General Education classes together, and participate in various co-curricular activities as a group. The James E. Holshouser Award for Public Service, formerly known as the Public Service Award, was created in 2007 to encourage, identify, recognize, and reward public service by faculty of the University of North Carolina system. Each year, UNCG puts forth a campus nominee to the Board of Governors for consideration for the award. The selection criteria include sustained, distinguished, and superb achievement in university public service and outreach and contributions to improving the quality of life for citizens of North Carolina. The creativity and impact of such achievements should be beyond the normal accomplishments of productive faculty. The Gardner/Holshouser award committee is currently seeking nominations for this distinguished award. In honor of their achievements, the campus nominee will receive a $1000 honorarium and be recognized at the 2019 Faculty and Staff Excellence Awards ceremony. The system winner, chosen by the Board of Governors, receives a $7,500 cash prize. To submit a nomination, or learn more about the award, please visit https://provost.uncg.edu/Holshouser/nominations.htm. Nominations are due by June 30, 2018. 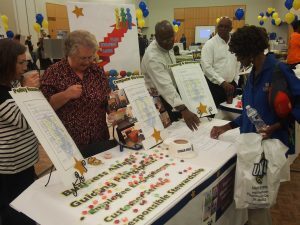 Three winners of UNCG’s 2018 Graduate Research and Creativity Expo represented UNCG during Graduate Education Day in Raleigh May 30. Graduate students Elizabeth Ellis, Alla Letfullina and Yener Ulus spoke with state legislators about their research and how it benefits North Carolina. They were accompanied by UNCG’s Greg Bell, associate dean of the Graduate School, and met with Representatives Amos Quick, Jon Hardister, John Faircloth and Pat Hurley. Ellis, an M.A. student in history, shared her research on North Carolina’s complicated Civil War past and how that past informs the state’s policies and memory of the Civil War. Letfullina, a Ph.D. candidate in nanoscience, discussed her research on creating an improved, cost-efficient and recyclable solid-state lithium ion battery. Her work contributes to North Carolina’s clean air and recycling initiatives. Ulus, a Ph.D. student in environmental health science, shared his research on how rising sea levels affect mercury in the coastal plain wetlands of North Carolina. His work is important for both fisheries and the environment in North Carolina, the U.S. and the world. The UNC Board of Governors has approved the establishment of a Joint PhD in Social Work between UNCG and North Carolina A&T State University. UNCG creative writing professor Michael Parker is one of the foremost voices in contemporary Southern literature. With six novels and three collections of short stories under his belt, and a new novel forthcoming, it’s full speed ahead. His short story “Stop ‘n’ Go” was selected for inclusion in the 2018 Pen/O. Henry Prize Stories anthology, an annual collection of the top twenty stories among the thousands published in the past year by U.S. and Canadian magazines. The O. Henry Prize Stories anthology has been an American literary institution since 1919, and in 2009 was renamed to reflect the partnership with PEN American Center. This was Parker’s third time winning an O. Henry Prize and the story was the second that came from his most recent book, “Everything Then and Since,” published last year by Bull City Press. But, if not to everyone’s tastes, the stories are certainly to a lot of people’s tastes. The collection of 23 micro-stories was a “staff pick” of the Paris Review and received enthusiastic praise in a number of other periodicals. Each story displays Parker’s unforgettable humor, woven between the small but poignant moments that reveal the rich internal lives of his characters, most of them firmly rooted in the rural South. Parker has received fellowships from the North Carolina Arts Council and the National Endowment for the Arts, as well as the Hobson Award for Arts and Letters and the North Carolina Award for Literature. His work has been anthologized in the Pushcart Prize Anthology and New Stories from the South. Recently, he spoke on a panel with writer Lee Smith at the Greensboro Bound literary festival. Parker came to teach in UNCG’s MFA Creative Writing Program in 1992 and in 2015 was honored with the first Vacc Distinguished Professorship, a recognition for a faculty member with a record of outstanding accomplishment as a teacher, scholar or practitioner. The appointment has allowed him to bring in high-profile visiting writers and to create writing residency opportunities for graduate students. “His work and the creative writing program are an exemplar of excellence at UNCG,” said Provost Dana Dunn. And the proof’s in the pudding; among the many other accomplishments of his former graduate students, Kelly Link had a story in the 2013 Pen / O. Henry Prize Story anthology and was a Pulitzer Prize finalist in 2017. Parker deeply values the opportunity to work with students in the MFA program, which was one of the first in the nation. Michael Parker’s newest novel, “Prairie Fever,” will be published by Algonquin Books in 2019. This project is supported by funds from the USDA National Institute of Food and Agriculture (NIFA). The abstract notes that prescribed burning and mechanical thinning are essential forest management practices in the Southeastern U.S., having many beneficial objectives including reduction in the susceptibility of forests to both southern pine beetle attack and wildfires. The four-year project will involve controlled field studies, laboratory studies, and watershed monitoring study to evaluate prescribed burning and mechanical thinning practices, roles of OM/DOM, formation of black carbon, and landscape processes on the transport of different forms of Hg via catchments and downstream Hg transformation mainly microbial methylation. Forest floor sample materials will be collected from experimental plots with different burning schedules and frequency and will be incubated under field conditions. Forest floor materials under different practices will be further tested for their propensities in leaching Hg and further methylation. An unmanaged and a managed 1st order watershed at three locations in North Carolina and South Carolina will be used to evaluate the landscape processes on the exports of Hg. With the results of the control study and field investigation, a box model describing production of methylmercury, toxic form of mercury, in forested ecosystems under different forest management practices will be developed. Dr. Holly Sienkiewicz (Center for New North Carolinians) received new funding from the New Arrivals Institute for the project “Refugee After School Program.” The abstract notes that many newly arrived refugee children need additional support and tutoring to achieve success in school. They also need the opportunity to experience activities that they might not otherwise get to experience such as Girl Scouts, sports activities and field trips. Adult refugees need help with employment assistance and English as a Second or Other Language (ESOL). The project’s objective is to prepare refugee children for success in school and adults for the workforce. An after-school tutoring program, social enrichment activities, and ESOL and employment readiness will be provided at two CNNC community centers that provide services to refugees. Dr. Laurie Kennedy-Malone (Family and Community Nursing) received a continuation of funding from the DHHS Health Resources and Services Administration for the project “Advanced Nursing Education Workforce: Academic Practice Partnerships Today for Competent Practitioners Tomorrow.” Dr. Karen Amirehshani and Dr. Kristin Curcio are co-principal investigators on the project. The project will enhance academic practice partnerships for NPs students and graduates providing care to rural and medically underserved persons.